← Lame Adventure 298: Untitled #298. 2012. 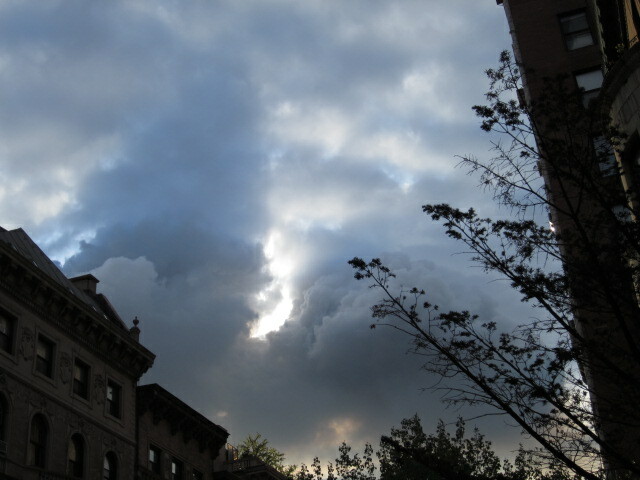 Although I’m slightly less spiritual than a tube sock, as I was returning to my Upper West Side garret at Magic Hour after another productive day of clock watching on company time, I looked up at the sky and saw this holy card-style cloud formation. 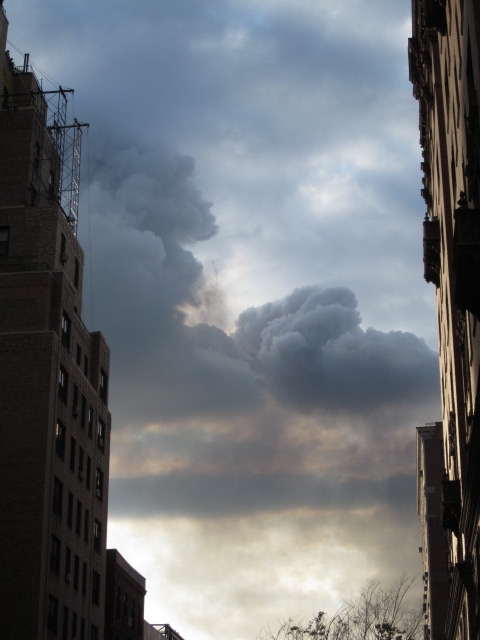 It was the type of cloud-cluster that begs for a soprano singing choir soundtrack as a gigantic Supreme Being hand emerges with a pointed index finger. Jaded New Yorkers: Now I’ve seen everything! After snapping my trademark crummy pictures of the mystical cloud formation, my thoughts drifted in the direction of my other recent encounters with life’s mysteries small and pointless. For example, every year, no matter what the holiday, my building has some pleasant reminder of the event. 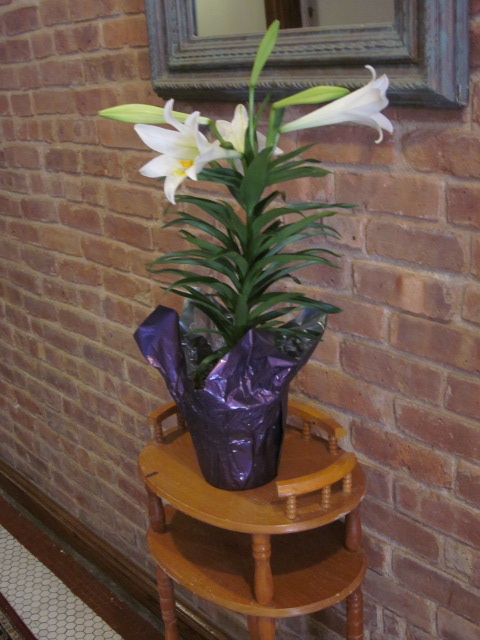 Me: That’s a lovely lily we have in the lobby! My Landlady: Who the hell are you? Then, she walked away. I’ve been renting an apartment in her 18-unit brownstone for almost 30 years. Possibly I’m being overly sensitive, but one would think there would be a glimmer of recognition that I’m her tenant by now. My Father: I can’t believe you’re gonna be (ickity) four! How did that happen? Me: (Ickity) four happens next year! Right now, this minute, I’m still (ickity) two! My Father: At least you’ve never been fat. That’s true but as my metabolism downshifts, I’m not feeling as svelte as I used to. I’m developing a bit of a paunch and from certain angles in states of undress, I’m looking marsupial. I know I need to exercise more and it would also behoove me to eat less crap and guzzle less beer. 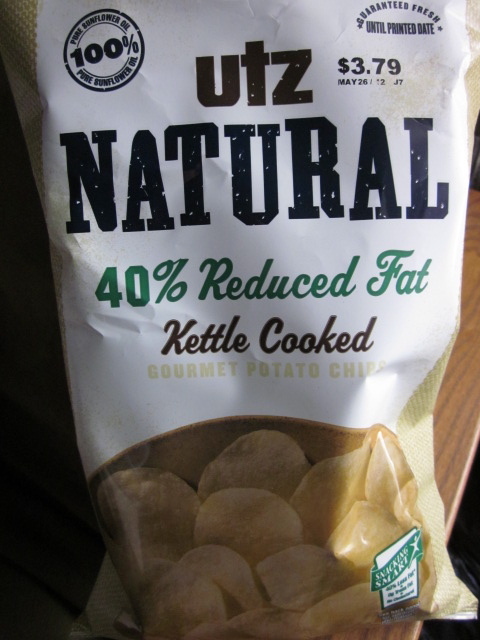 Over the weekend, I wanted potato chips, but I decided to get the 40% reduced fat variety and limit myself to the recommended serving of just 20 chips, but who ever eats such a puny amount, much less buys the reduced fat version? Bet you can't eat just 20. To psyche myself into doing so, I reasoned that I must think as if I’m lost in the woods and I’m obligated to make these rations last to survive. 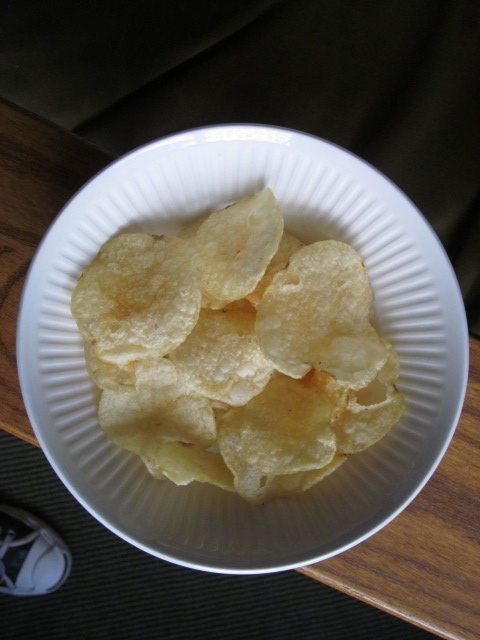 What 20 chips look like in a bowl with a sneaker. 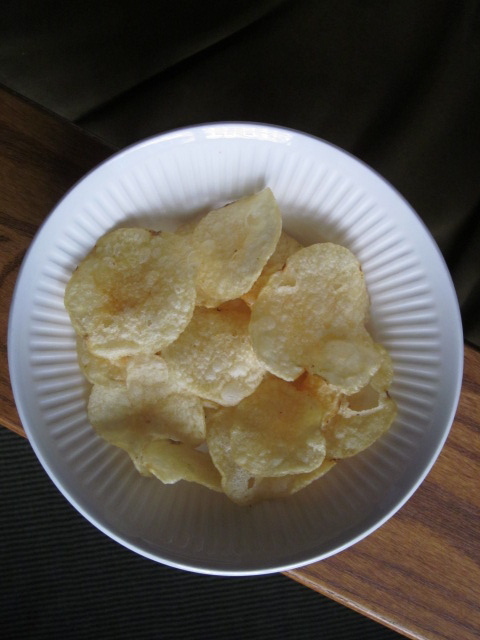 What 20 chips look like in a bowl sans sneaker. Me (thinking): Who am I kidding? I’m in an apartment in the heart of Manhattan and I want to pound a high octane beer with these chips. Yet, I practiced some restraint as I proceeded to inhale my 20 chips in one gulp like an anteater on steroids. Thanks to my remarkable willpower combined with Mad Men being the only show worth watching on TV, I have yet to chow down the rest of the bag. 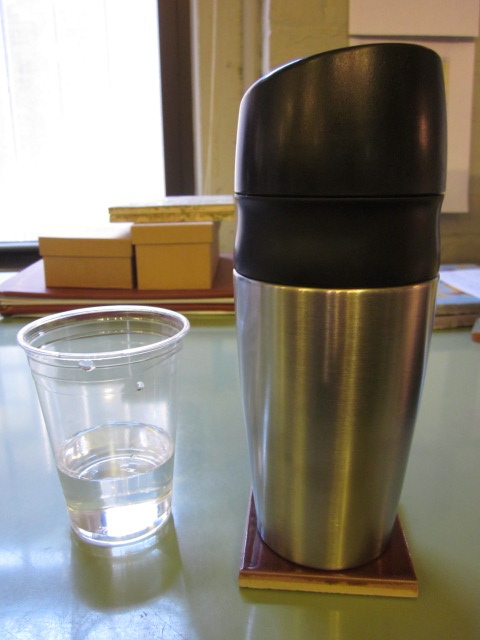 Last week at work, after finishing a 16-ounce tea chased with a 10-ounce cup of water, this flood of hydration nearly ruptured my bladder. Fortunately, I could easily win Olympic gold if there was a competition for hightailing from my office to the bathroom in breaking the sound barrier time. 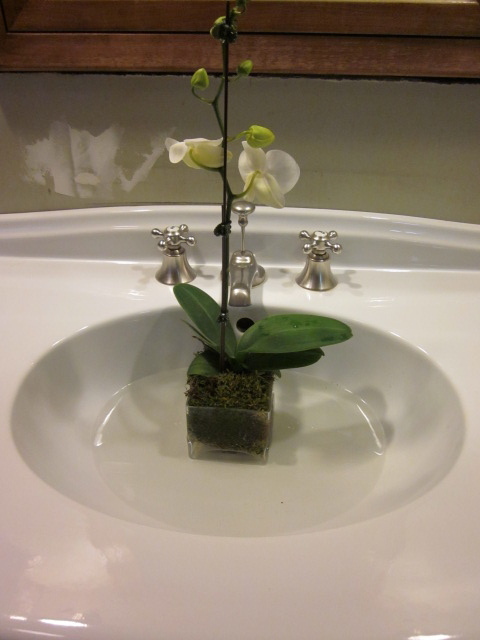 I switched on the light and saw an orchid, a gift to my boss, Elsbeth, soaking in the sink. "Can a plant have some privacy around here?" Me: Your orchid is soaking in the sink! Elsbeth: Oh! I put it there! Me (screaming inside my head): Why are you doing this to me when I need to take a piss worthy of a herd of farm animals? Me (speaking through gritted teeth): I figured. Remarkably, Elsbeth heard the earlier unasked question. She moved the orchid quickly solving at least one more of my life’s pointless mysteries. Now the orchid is sitting on the sink. This entry was posted in Humor, new york city and tagged aging, dieting, easter lily, orchid, potato chips, reduced fat, spirituality, Upper West Side. Bookmark the permalink. 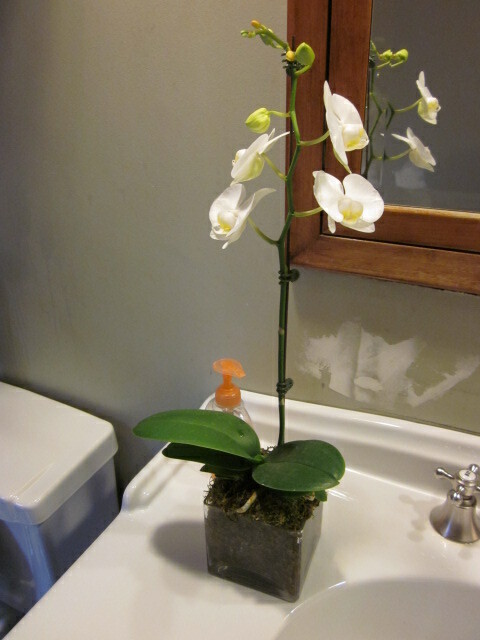 I think the orchid should stay in the bathroom. It looks very nice there. thank you. It’s still in there right now. I told it it looks nice there, but it’s a snarky orchid so it flashed a leaf at me. I think it would rather sit on Elsbeth’s desk. No, but I do like to wash my mitts post-throne. I lack the anatomy for the shake and go option. Point taken. I guess you could sit there for an extra ten minutes and go with the air dry option, no? Well that was rather laconic. But some questions deserve a direct response I guess. Orchid update: it’s been relocated from the bathroom to the ledge in my lord & master’s office prompting me to refer to it as The Traveling Orchid. I really liked their first album, but with the passing of both Roy Orbison and George Harrison I haven’t seen them putting out anything recently. Oh, never mind, I thought you said Wilbury’s. My bad. Possibly my superior’s mind went in that direction, too, for there was a distinct disconnect when I referred to our pet plant as that. Maybe we should call it Wilbury the Orchid. I’d be quite honored to have had some small part in naming the Plant. If you hadn’t gone in that direction, you could have named it Robert. Why Robert? Is it because of the trend to call pets names like Doris and Fred and the children Apple and Prune? No I was going in a Led Zeppelin direction for the Plant. But I think Ms. Paltrow might have been on to something. Certainly better than Mr. and Mrs. Zappa. Ah! Must be slowing down over here, but it looks more like it would be called Wilbury. ;–DDD … at least you’ve kept your looks. Why thank you Robert! I suppose maintaining this level of average is a lame achievement of sorts. You’re not getting ickety anything, girl. You’re getting better and better. My philosophy has always been that each day further from an outbreak of acne is an improvement. Love the lily. Your landlady needs a visit from you in her native surroundings. Aw shucks, you’re such a good buddy SDS! Lily-update: my colleague, (not) Under Ling (anymore), reported to me this morning that Elsbeth took Wilbury home with her last night. Boo hoo! Maybe the cloud formation was God trying to warn you about the orchid in the sink. Strictly speaking, not all of his signs HAVE to be about the real important stuff. Point taken Tom. Thanks for visiting and taking the time to comment. I love the video on your About page. It ‘s a lot of fun! I laughed out loud at the part with your landlady.